Dear Chef Boon. I just want to personally thank you for these past 17 months. I want to share with you one of my reasons for joining this program. You see, I come from a well-off family and my whole life, my parents spoiled me like crazy. Growing up, we had many helpers in the house, and they always did everything for me – I never had to do chores my entire life. So 2 years ago, when I graduated from university, I realized I was already 23 and I didn’t know how to do anything for myself. Things like cleaning, laundry, washing, cooking. I did not want to be like this for the rest of my life. So I knew I had to do something. When I joined a one-month cooking course back in Manila, I knew that this was the kind of thing that would teach me these skills. At the start of this program, I did not even know how to hold a broom. Or a squeegee. I did not know how to clean a drain, wash pots and pans. I was lazy. Every time something needed to be settled in the kitchen, my other classmates like Sharleen and Tang Jie would be the first to volunteer and I just stayed in the sidelines. I could not even bear to touch the drains. I never held a pan or touched a stove before. As expected, I had a very difficult time in this program. Everything was so new to me. I knew it would be hard, but I didn’t know it would be THAT hard. You were right when you said I was soft. I am soft, I’m soft because I’ve been living a spoiled life for too long. While I realized over the course of the year that I’m not exactly talented/gifted in cooking, I am still very proud of how far I’ve come. I feel like I’m so different from the person I was when I started. When the drains are clogged, I’m one of the people who settles it now. At home, I notice I pick up after myself out of habit. When I try cooking at home, I also notice I’m a lot more organized and disciplined. It’s just that I have a hard time in school when everyone is watching me. But I can wash pots and pans very quickly now, and I’ve also learned to think on my feet. I know that all of this progress is not possible without you and all the other chefs in our school. Thank you for all your hard work and patience in dealing with slow students like me. Thank you for caring and looking out for us and teaching us the right way of doing things. It’s really the repetition, the habit that you drill into us everyday, the scolding and the nagging that helped me improve and build my character. Thank you for trying to instill good values in us. I really appreciate it from the bottom of my heart. 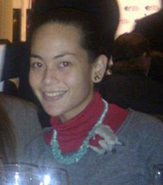 Before this, I came from a university in the Philippines where the environment was very free, very relaxed. The teachers did not care at all and we could do anything we wanted. Our learning experience was up to us. So you can imagine how surprised I was when i found myself in a school where the instructors actually cared. While I am still unsure of where my future is headed, whether to continue in this line or not, I do know one thing – I am a better person for having joined this program. I have no regrets, and I have learned so much from you and all the chefs in this past year. Thank you for being a part of it. Best wishes to you Chef. 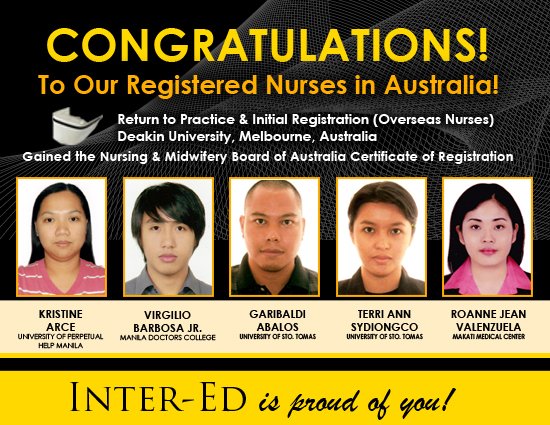 Congratulations to our Registered Nurses in Australia!